Imagine for a moment that you are approached by Mr. I, a shareholder of a publicly traded company, TechCo, in Korea that had, at its peak, an estimated worth of billions. However, one morning, Mr. I awoke to learn that the company’s worth had vanished almost overnight as a result of a suspect transaction, allegedly made by the company’s founder, Mr. S, whereby Mr. S purchased PaperCo, which he also controlled, worth approximately US$2 million, for an astounding US$1 billion in TechCo’s shares. The transaction allegedly enriched Mr. S to the tune of US$100 million, while TechCo’s stock plummeted and its investors suffered billions in losses. Korean criminal authorities launched investigations into this allegedly fraudulent transaction, during which time Mr. S fled to Hong Kong. According to reports, Mr. S is currently living in Hong Kong in one of the most affluent communities on the Island. Mr. I, a Korean business man, wants your help in a multijurisdictional enforcement action against Mr. S – as the Korean courts have issued a decision against Mr. S, ordering him to pay approximately US$5 million to Mr. I. In addition to being a US citizen, Mr. S is also apparently a large donor to a US Ivy League University, which his daughter also attends. In Hong Kong, only limited pretrial discovery is available. There are no third-party pretrial depositions. Leave of court is often required. Meanwhile, US litigants have a robust array of discovery tools to choose from. So as a Hong Kong litigator, what discovery tools can you use to assist Mr. I in his Hong Kong proceedings? One system that could prove fruitful in exploring is the US discovery system. To find out more, including what information you can obtain and what you need to show to get it, check out the Evidence Feature included in this issue. 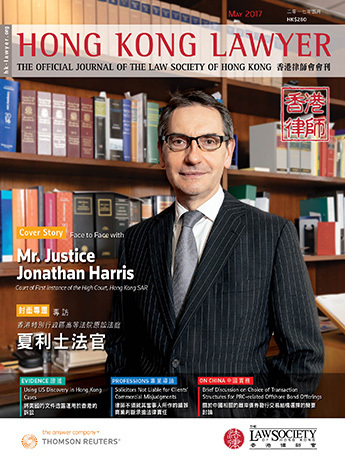 Elsewhere in the May issue, the Professions article first examines the decision of the Supreme Court of the United Kingdom in BPE Solicitors & Anor v Hughes-Holland  UKSC 21, holding that a firm of solicitors is not liable to its client for losses arising from the client’s own commercial misjudgment, and then concludes by discussing the decision’s relevance to Hong Kong. The On China feature outlines major factors and the implication of those factors on different transaction structures for PRC-related offshore bond offerings, which issuers should keep in mind. Also of interest is the Legal Markets piece, which discusses the future for law firms in Hong Kong in the context of current market trends, and the Leisure contribution, which recounts a trip to Lai Chi Wo in the northeastern New Territories, where local villagers, academics, volunteers, NGOs and others are working to revitalise the nearly-abandoned rural Hakka community through cultural restoration and environmental rehabilitation initiatives.